I’m looking at these Cherry Blossoms and it’s been one of the highlights of my year so far. What are you currently planting and planning to blossom this quarter? If you’re not working on this now- you need to be! 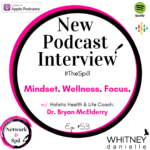 Make sure you’re following me on IG: @networkandspill and @whitneydaniellecoaching.